When Related Fluid Power Ltd invested a quarter of a million pounds in a new 18 pallet MAZAK machining centre, quick set up times and flexible machining were key to operating their investment at its maximum potential. As a designer and manufacturer of hydraulic controls, custom manifold controls and hydraulic AC and DC power units, Related Fluid Power is a supplier to original equipment manufacturers in both the industrial and mobile sectors. The addition of the 18 pallet horizonal machining centre to the company’s CNC based machine shop in January was designed to enhance their existing production capabilities, particularly for scheduled orders, while keeping stocks of finished components down to a minimum. The company had already introduced horizontal machining centres within their machine shop as they found it offered tooling benefits over vertical machining centres. However, the workholding tower units they had been using were proving very heavy and a lighter option would be vital to run the new machining centre at maximum capacity. After considering a number of different suppliers, they chose to purchase another ten System Bock MonoQuad 150.8 tower units from Roemheld (UK), to add to the four they were already using within the machine shop. Efficient operation of the new 18 pallet machine has been key in enabling Related Fluid Power to meet its increasing production demands. Because the Fife-based company operates within a niche market, with 85% of its manifold business alone purely custom-made, it has prospered during the past few years, despite the downturn in manufacturing being experienced throughout Europe. With an average batch size of just 15 – 20 components, the company is geared towards fast changeover. The new machining centre, when equipped with the System Bock towers, offered the ability to simultaneously satisfy a number of customers’ requirements during a single run. 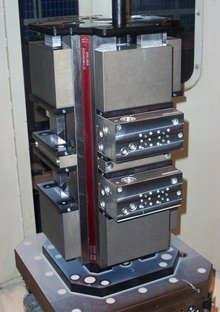 The System Bock MonoQuad 150.8 towers are flexible enough to enable material ranging from 450mm sq. to 150mm x 100mm to be machined, maximising the machining centre’s productivity. The System Bock tower units also mean that the 18 pallet machine is able to run unsupervised through the night, increasing productivity without increasing operator time. This is a key factor in Related Fluid Power’s drive towards ‘lean’ manufacturing. With customers demanding year on year price reductions but with no changes to quality requirements, the company is dedicated to increasing its production efficiency using ‘lean’ techniques. Having the 18 pallet machine running unsupervised enables the more effective use of shopfloor resource. For the 17 members of staff on the shopfloor, multi-tasking is becoming crucial. So the reduced need for set-up and supervision of the machining centre means that the skilled operators can concentrate on programming, monitoring progress and training. 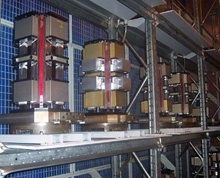 As the Bock towers require little maintenance, with any swarf easily cleaned out of the open design, there is also a significant reduction in downtime. Quality is also a key consideration for ISO 9001 – 2000 accredited Related Fluid Power and the company undertakes 100% testing of finished orders for some customers as standard. The set-up of the machining centre with the System Bock towers offers the optimum repeatability that the customers demand.